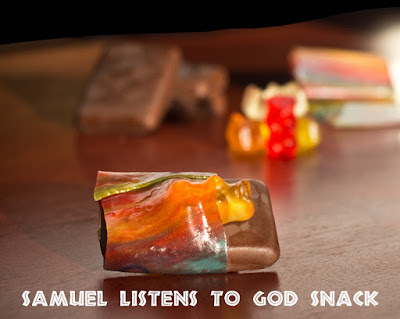 This idea was part of a downloadable PDF called Kings Lesson #2 Samuel listens found here. 2. 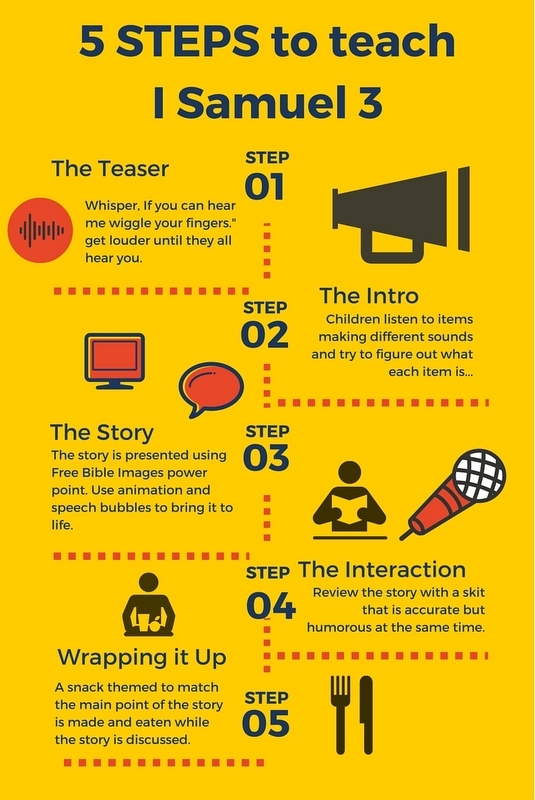 Next I used an opening activity about listening that I found on Mission Bible Class. I had my assistant gather some different things that made noises. She hid behind a curtain so the children couldn't see what she had. Then they had to listen and figure out what was making the noise they heard. 3. From there, I segued into the Bible story which was going to be about listening. 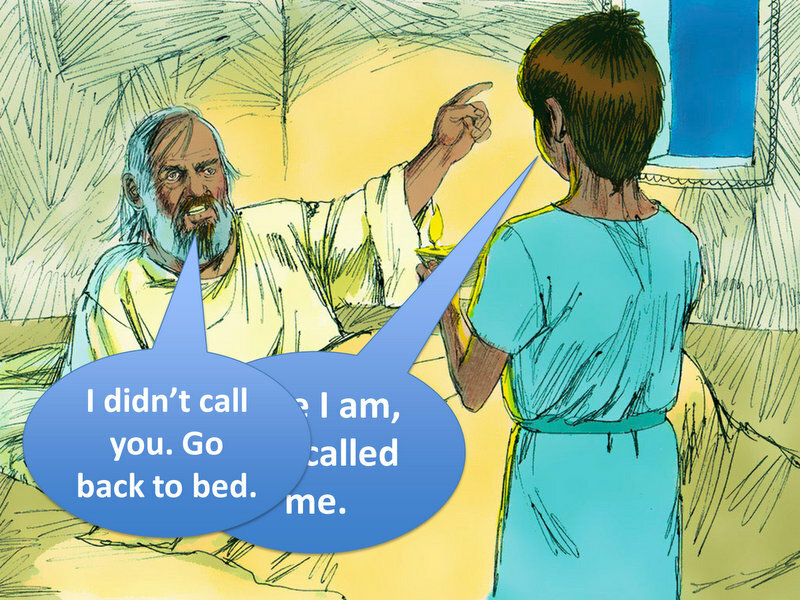 I use Free Bible images to visualize the lessons I teach. Most of their illustrations are from Sweet Publishing. I like the Free Bible images site because you can download the entire power point story in one click. 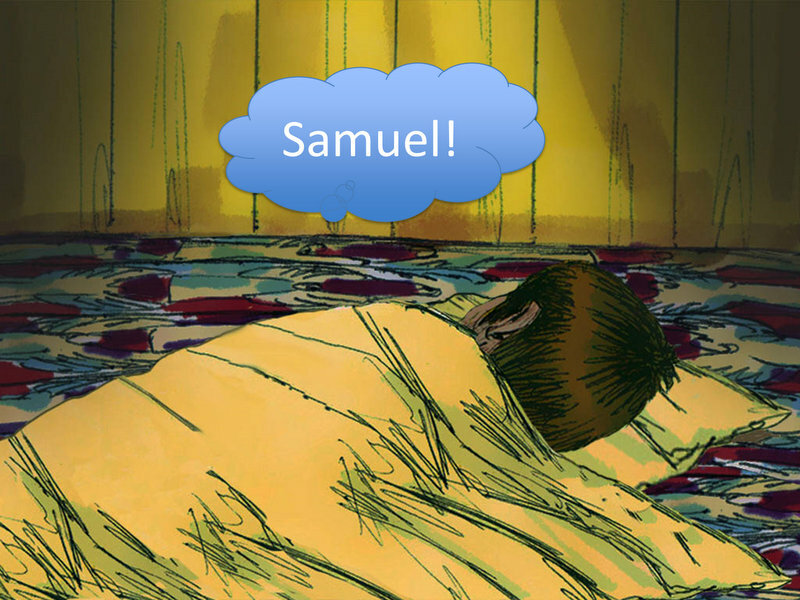 I add speech bubbles like the ones in this picture and use the animations tab to make them appear as I tell the story. In the above picture Samuel says,"Here I am, you called me." on the first mouse click. On the second click, that speech bubble disappears and Eli's speech bubble appears (use "start with previous" command to make the second bubble appear when the first disappears). Animations can really make your story come alive. 4. 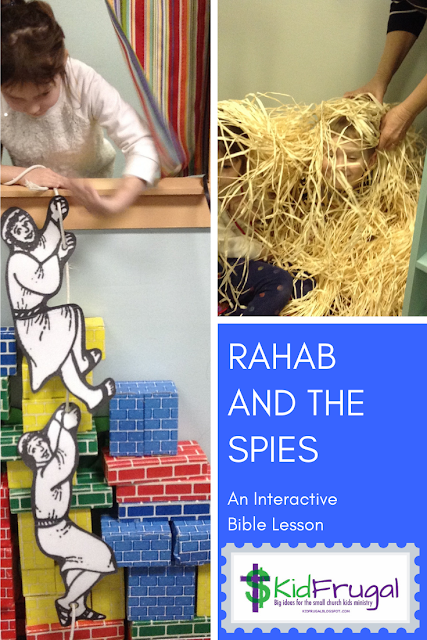 When we were done with the Bible study portion of this lesson, I had a skit prepared to review the Bible event. I chose it because it accurately conveyed the biblical events, but it was humorous at the same time. The skit can be found here. 5. I saw a lot of nice crafts for this story. I decided to make an edible craft instead. I found a picture for this craft on Pinterest. It used chocolate covered graham crackers (the bed), fruit roll-ups (the blanket) and gummy bears (Samuel). Teddy Grahams would have worked well for Samuel too. While we ate our snacks, we discussed what it means to listen. The instructions for making this snack are here.